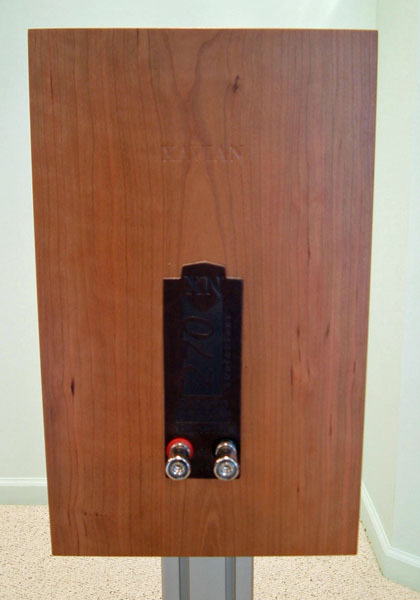 Xavian Loudspeakers was founded in Prague in 1996 by Italian Roberto Barletta. Building speakers in the Czech Republic allows Mr. Barletta to design and build Italian-quality speakers at more affordable, if not inexpensive, prices. The Xavian XN270 ($5,200 per pair) is the largest of three stand-mount monitor speakers in Xavian's XN series. It is a two-way sealed-box monitor loudspeaker constructed of thick, high quality MDF. The front baffle is 30mm thick; the rest of the cabinet has 22mm thick panels. The MDF panels are joined using locking miter joints and are heavily braced. The interior of the speaker uses foam, bituminous pads, and MDF pyramids to break up internal reflections. The exterior of the speaker is veneered so flawlessly that I cannot imagine anyone who sees it not assuming that it is solid wood. In that respect, Barletta remains true to his Italian roots. The drivers used in the XN270 are Danish-made Scan-Speak Revelators. The tweeter is a 29mm fabric done. The 180mm bass/midrange uses a slit paper cone in its construction. As an example of the attention to detail lavished on these speakers, each tweeter is individually fitted to its baffle opening. Evidently, the mounting plates on these tweeters vary a few tenths of a millimeter in diameter. To compensate for this, the opening in the cabinet's front baffle is matched precisely to each individual tweeter. There is no gap between the tweeter and its surrounding veneer. 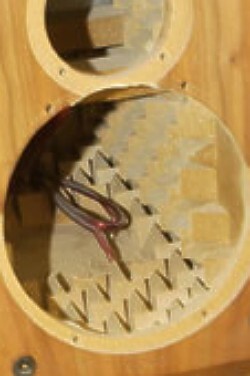 The single pair of binding posts per speaker is sourced from WBT. 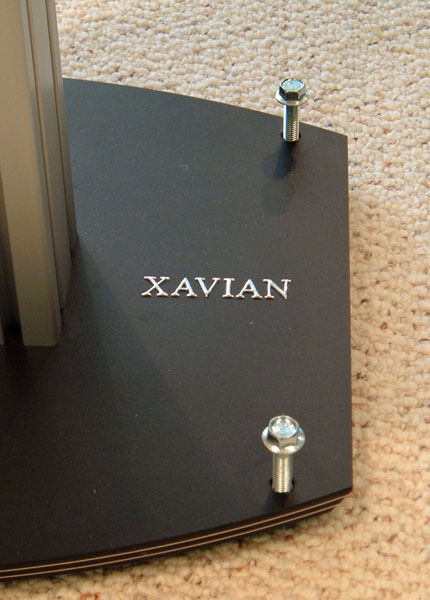 Xavian uses their Signature Platinum version. These are set into an embossed leather panel on the back of the cabinet. Everything is tied together with a first-order crossover made from the best available passive components. This crossover, along with the cabinet shape, results in a speaker that is both time and phase aligned. Small speakers such as these require stands. I was able to use Xavian's ST612 Metallico speaker stands ($2000). These bolt to the bottom of the XN 270s and raise them about 25 inches off of the floor, resulting in a vertical listening axis located between the tweeter and mid/bass driver. 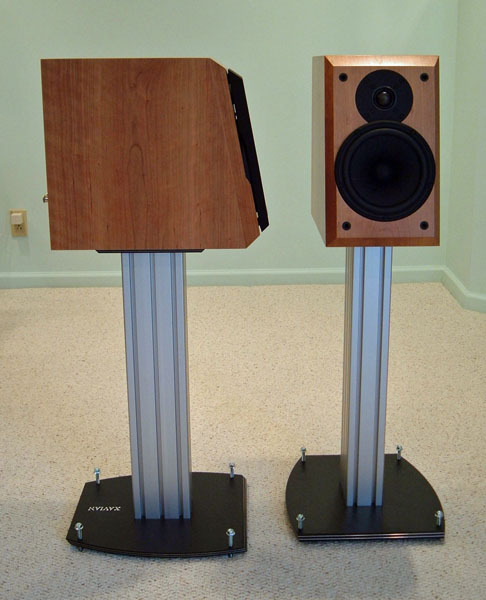 These stands should be considered an integral part of the speaker itself. They can be filled with sand or other materials for additional stability. I used them unfilled. They are still quite heavy in that configuration. Spiked feet are provided that utilize an integral thumbscrew for easy adjustment. I used some M8 bolts from my local Ace Hardware to level the speakers and raise the stands off of the carpet. Leveling these speakers proved far more important sonically than spiking through the carpet. Everything considered the first word that comes to mind in describing the Xavian XN270s is "fanatical." Every aspect of their design, construction, and performance has been considered and optimized to provide the listener with a remarkable level of performance. In this regard, they honor their Czech heritage. I was lucky enough to have Dan Barnum of Half Note Audio, the Xavian importer, bring the XN270s to my home and aid in setting them up. As a starting point, we put them where my Magneplanar MG1.6s are normally located. From there, the speakers were moved slightly back as a result of both listening and the use of an Excel program to identify room modes that Dan had brought with him. I was reassured to see that the final location wasn't very far off of what I had arrived at on my own. In this location, the XN270s stood about five feet from the rear wall of my listening room and about nine feet apart. 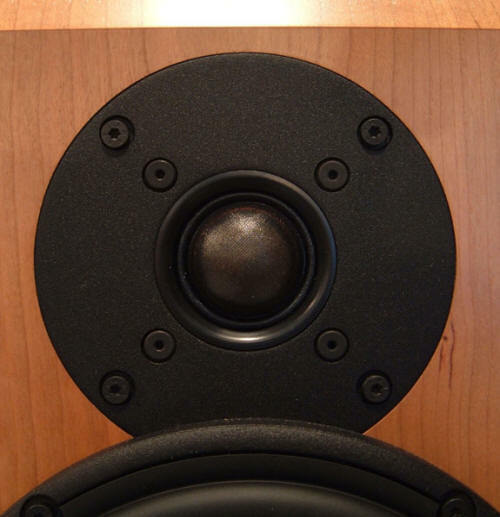 A small amount of toe-in was used—I could still easily see the inside panels of each speaker. I should note that the Xavians are made to be listened to with their grills removed. Dan appeared to be pleased overall with the set up and left me to listen to the speakers on my own, which I have done for nearly three months. When I sat down to listen on my own, I found the center image to be slightly shifted to the left. This was due to the fact that I had changed listening chairs. The difference was subtle but I set out to correct it. In the course of doing so I found that everything matters in setting up these speakers. The distance to the rear wall mattered. The toe-in mattered. The distance to my listening position mattered. How level the speakers were mattered. The Xavians revealed every small adjustment in the speaker's position. In saying this, I don't want to give the impression that the speakers were fussy, that the listening window was extremely limited, or that extraordinary amounts of time were needed to set them up. These were not the case. It is simply that the Xavians revealed every change in position, even very minor ones. Once the speakers were happy with everything, however, they presented an extremely wide and deep sound stage into which they then disappeared. These speakers are not very large. They have only a 7-inch woofer/midrange driver and it works in a sealed-box enclosure. 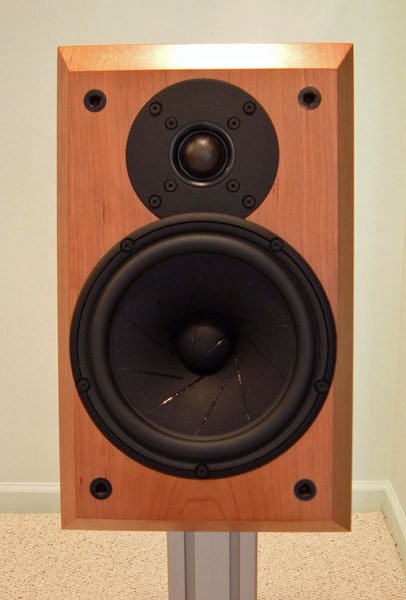 Yet, the bass performance of these speakers is utterly remarkable. I did not play any recording—vocal, small ensemble, medium ensemble, large orchestra—where the bass performance was ever less than excellent. The ability to reproduce deep realistic bass frequencies was probably the most impressive aspect of the Xavian's performance. It was frequently difficult to correlate the bass I was hearing with the small speaker I was seeing. To solve the problem, I simply listened with my eyes shut. Of course, small monitor speakers such as these should reproduce midrange frequencies with extraordinary finesse. And they do. Listening to Trio Mediæval's Folk Songs CD (ECM New Series B0009888-02) through the Xavians revealed the beautiful voices of the three female singers with astonishing clarity and realism. Individually and in harmony, their voices rose and fell in volume while expanding and retreating within the confines of the performing space. It is hard to imagine how the midrange performance could be any lovelier or more realistic. The treble performance of the Xavians would best be described as superbly self-effacing—it is there doing an extraordinary job of high frequency reproduction yet never drawing unnecessary attention to itself. I found myself noticing how the sheen and shimmer of cymbals seemed just that more realistic than I was used to. The overtones of wind instruments such as flutes and oboes also benefited from the remarkable resolution of the Revelation tweeter. And then there is the soundstage. As I have already noted, the Xavians disappeared. The outside of the soundstage regularly exceeded the outsides of the speakers themselves. Performers existed in well-defined locations within the soundstage. Depth was realistic. Image height was impressive. The overall result was a very concrete sense of being in the venue of the recording on every CD that I played. I could elaborate further on each of these aspects of the Xavian's performance—bass, midrange, treble, and soundstaging. I could cite numerous CDs, each of which would provide an excellent example of a given facet of its performance. To do so, however, would be to relentlessly repeat what I have already said. This approach simply would not get at the true nature of what these speakers accomplish. There are a number of areas in which the Xavian XN270's fanatical attention to every detail of their construction and performance make themselves evident. I have struggled to find ways of describing these differences and have settled on the following categories as a way of exemplifying them. I am not certain that I am absolutely satisfied with these descriptions but I think they work well enough to allow me to illustrate the points that I want to make. Intelligibility/Detail: The Xavians offer that subtle degree of improvement in intelligibility and low-level detail that comprises the difference between actually understanding something sung or played and simply being left with an impression of it. Often you first hear these improvements in the extraneous noises on the recording, such things as audience comments, background noise, and so on. Fortunately, this improved resolution also gets more of the subtleties of phrasing, both vocal and instrumental, across. As a listener, you suddenly realize that some previously unclear lyric or musical subtlety can now be readily heard and understood. Speed/Coherence: This is the ability of the speaker to both start and stop quickly. Individual instruments and voices don't run into or over each other. A good example is Ornette Coleman's "Happy House" from the Finding Forester sound track (Columbia/Legacy CK 85350). I don't particularly like this sort of jazz and I definitely don't claim to fully understand it. But through the Xavians there is a sense of organization, a rationale, within it that becomes readily apparent. Through lesser speakers the sound is just an unorganized cacophony. I attribute this difference to the ability of the Xavian speakers to keep up with the music and keep each musical line discrete, while preventing them from overlapping each other. Dynamics: The ability to accurately respond to both very small and very large changes in volume is necessary to reproduce music realistically. The Xavians have this ability. They are just as good at reproducing extremely subtle shifts in volume as they are at going from silent to shatteringly loud. An excellent illustration of their dynamic capabilities was the way that the XN270s handled the transitions from faint and delicate to very loud and angry and then back to faint again on Track 2, "Legend of Herlen" of YoYo Ma's Silk Road Journeys, When Strangers Meet (Sony SK89782). Taken together, these exemplary aspects of the XN270's performance result in a noticeable increase in musical realism—a difference that is readily apparent. It is this realism, this sense of hearing everything within the recording—at the right time, in the correct place, and at the appropriate volume level—that makes the Xavians so remarkable and elevates them from the realm of very, very good loudspeakers to that of reference quality components. The Xavian XN270s are small, monitor speakers that reproduce a full scale frequency range. They produce all the bass that is necessary for realistic reproduction of drums, acoustic bass, and the low octaves of the piano. I never felt the need for any additional bass output with any of the music that I listened to. Their midrange reproduction is as good as I have ever heard. Hearing the XN270s reproduce vocal music while driven by the Grant Fidelity A-534B's 300B tubes was not an experience I am going to easily forget. High frequency reproduction is superb. The overtones of bells, wind instruments, and cymbals were reproduced both realistically and with excellent control. Soundstaging is as good as I have heard. Are there any drawbacks to these speakers? Well, at $7200, they are fairly expensive for most of us. The more I have listened to the XN270s, however, the more they have seduced me with their musical performance into viewing them as fully justifying their cost. Listen to them at your own peril.